Free Body Composition TODAY only! Don’t forget to stop by and get your FREE body composition done today! The InBody will help you reach your fitness goals more efficiently and effectively! 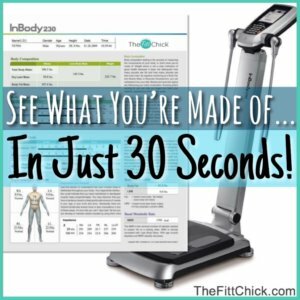 The InBody measures your body composition and displays it on an organized, easy-to-understand result sheet. The results helps you to see where your fat, muscle, and body levels are and acts as a guide to help you achieve your goals: whether that is shedding a few unwanted pounds or a complete body transformation! Come meet with me today and learn more about your body then you ever thought possible! The InBody is such a great way to see help you see what type of fitness and nutrition plan will help you see the results you are looking for!